Mimi Flys: Three M&S Black Friday Beauty Deals you CANNOT MISS - THEY END TONIGHT! Three M&S Black Friday Beauty Deals you CANNOT MISS - THEY END TONIGHT! First up is the Gift Of Glow set by cult beauty brand Pixi. The set includes a full size of the Pixi Glow Tonic (something I swear by) and a full sized Glow Mud Cleanser, packed full of Glycolic acid to brighten and chemically exfoliate the skin. Both together retail for more than the price of this entire set! You also get a full sized pack of Make up melting skin care wipes and a mini rose glow facial oil. Since using the pixi range I've noticed my skin has far less breakouts and I often get compliments on how 'glowy' my skin is... and I'm not the only one to rave about it. Just google Pixi Glow Tonic reviews to see how loved it is. As a huge fan of Glycolic Acid, I had to include yet another bargain but high end skincare set that includes my skin's favourite ingredient. REN is loved by everybody, and this set is probably one of the best value deals I've seen this year. The Beauty Booster's Kit is usually £32, but today it is £15. It includes a large full sized Glycolactic radiance renewal mask (50ml) That usually sells for £35 on its own - That means that in buying this kit your getting an amazingly effective product for half the price, plus extra products too! 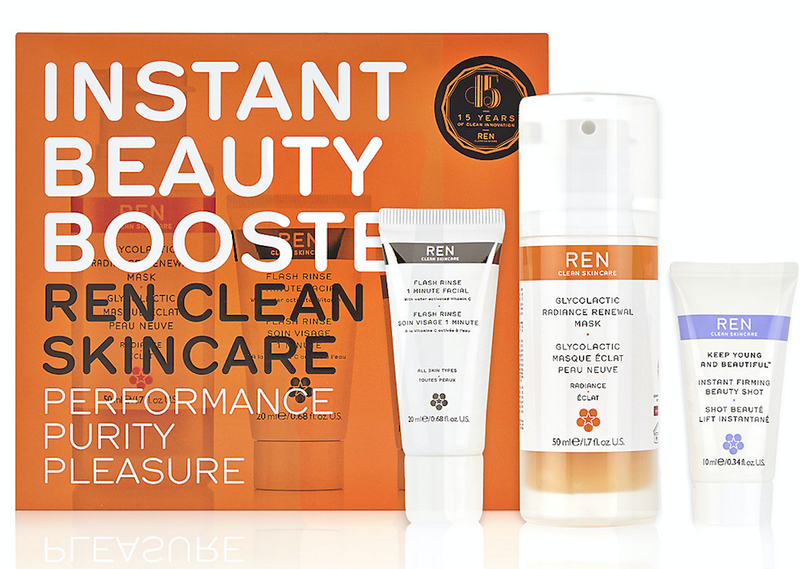 You get a mini Ren Instant Firming Beauty Shot, and a travel sized Flash Rinse 1 Minute Facial too. Such incredible value. The last and final Item I bought from M&S was their Rosie Huntingdon Whitley range of PJ's - In particular, this beautiful pair of 100% Cashmere PJ bottoms. I chose black, but they also come in a lovely Champagne colour. In this Black Friday deal you can get the RHW Cashmere bottoms for £69.30, instead of their usual price of £99. I can vouch that they last forever, and wash really well - so they are a great investment and if you want to treat yourself to some cashmere then this is a great deal. So if you still have the stamina to do some last minute Black Friday shopping, I'd highly recommend heading over to www.marksandspencer.com and checking out what they have to offer. I assume that most of these deals end tonight, possibly tomorrow. I am NOT sponsored by Marks and Sparks FYI - I just wanted to share the love! All links however are affiliate links. What did you pick up this Black Friday? Is there anything that I should be checking out before its all over? Let me know in the comments!